A longstanding Lewisham councillor and ex-Conservative MP has criticised efforts to silence Anne Marie Waters at a hustings event in the borough tonight. Ahead of this Thursday’s Lewisham East by-election, campaign group Bring Back Democracy are hosting election hustings in Catford this evening, but Labour Party candidate Janet Daby has already pulled out citing her reluctance to give the For Britain leader “the oxygen of publicity”. There are also rumours the Conservative Party candidate will follow suit and boycott the event. But Councillor Nicholas Bennett, a local councillor for more than 40 years and Tory MP for Pembrokeshire between 1987 and 1992, defended Waters’ right to speak at the hustings and criticised attempts to close her down. “Freedom of speech is central to our democratic process and nowhere more so than in a parliamentary election,” the former school teacher wrote on a local news website. 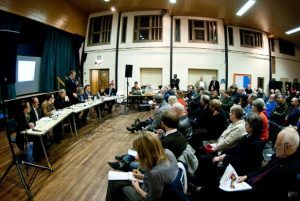 And other Lewisham residents joined in calls to let her participate saying the people of Lewisham “had the right” to hear her speak. Jenny Roblett said: “I believe the free people of Lewisham have the right to hear Anne Marie speak. They also should have the right not to listen. It’s THEIR choice and not for one person to decide for them just because HE doesn’t agree with her views. Local voters also said it was unjust to label Waters as “far-right” insisting she had many policies aside from speaking openly about Islam. “To frame Waters as merely an ‘anti-Islam’ candidate is misleading and unfair. She is campaigning on a wide-ranging manifesto, which if you read it, you will discover to your surprise that it is not far-right,” Dave Bosworth explained. A defiant Waters has said she will attend the hustings regardless but has been forced to hire private security to protect her after threats of violence and intimidation from far-left groups.